The Portland Police Bureau has made the decision to re-open the case regarding the allegations brought forward against Mr. Al Gore. Consistent with our policy regarding open investigations, the Police Bureau will not be commenting on any additional specifics regarding this case at this time. Earlier today, I predicted no one would want to hear more from the accuser, who has now come forward, identified herself and said she's willing to file a police report. Molly Haggerty, the woman accusing Al Gore of sexual misconduct during a massage in 2006, has agreed to be publicly identified. She tells more of her story to the National Enquirer. The Enquirer claims she has new evidence and is now demanding a full police investigation. Oddly, the Oregonian, while reporting on her enhanced version to the Enquirer, which reveals her identity and shows her holding up a pair of pants, continues not to print her name . I think this story died last week when it was reported Ms. Haggerty wanted large amounts of money for her story. Yet, in her taped statement, you hear her telling the police investigator she's not doing this for money, she's not interested in money and she just wants justice for women. Her credibility is shot. Continued interest level in this story: zero. Time to put it to bed. The Portland Police Department has put the audio of the Massuese's interview online. Part 1 is here and part 2 is here. Again, she's reading from a statement prepared by her lawyer which he sent her for editing, but she does ad-lib and there is some q and a during and afterwards. So far no one has taken her up on her $1 million offer for the story, but a source tells Page Six she's preparing to come forward and identify herself. A source told us, "She's ready to come forward and sell the story with even more salacious details. But she wants $1 million. Her attorney is shopping for a deal, and while there are many media outlets interested, there are negotiations going on because the price tag is way too high." Howard Kurtz at the Washington Post reports that the Enquirer says the masseuse accusing Al Gore of sexual improprieties asked for $1 million for her story. It says it decided not to pay her anything and conducted only a brief interview with her, verified some facts (like Al Gore was in Portland and the woman had billed the hotel for his massage) and then wrote the story mostly from police reports. I consulted with an attorney as this was so overwhelming and I felt the need to understand my rights and choices in a private setting. Since all I have ever been interested in with this situation is stopping this from happening to others, I decided I was not interested in making any money from this case. I did not want to be labeled a gold digger like women in this situation are often labeled. And I don't care about judgments for money and some army of lawyers fighting another army of lawyers who would not bring back my pre-assault sense of peace and safety. I don't want to be bought off into silence. I only want Justice and having this ugly thing come out of the shadows and into the light where it cannot continue any more. And for this man to be stopped from what he has been doing which should have been done a long time ago. I know that I'm not the first Woman to be assaulted by him. Update: WaPO reports the Enquirer says the woman asked for $1 million for her story, through her lawyer, but it decided not to pay her anything. Instead, it talked to her for a few minutes and relied on police reports for the rest. The Enquirer strikes again. This time Al Gore is the target. The 73 page police report (available here) includes the alleged victim's 2009 statement about a massage she gave to Al Gore at a hotel in Portland Oregon in 2006. The Oregonian account is here. The woman claims he had been drinking. There's a funny part where he asked her to go into the bedroom part of the suite and listen to Pink on his iPod singing "Dear Mr. President," a song about Bush. Al and Tipper Gore confirmed today they are separating. They've been married 40 years. They announced the decision in an e-mail to friends and supporters. Gore's office has confirmed it. The Times Online has a feature article on how wealthy Al Gore has become in the past seven years. When he lost the 2000 election, his net worth was about $2 million, consisting of his two homes and an investment in an oil company. Now, he's worth $100 million, earned through stock options in Google and Apple to book advances and speeches to investment firm holdings and investments in green and other tech ventures. No wonder he doesn't want to be President. VF: Al and Tipper Gore Interview: "We Were Roadkill"
Vanity Fair's September issue has a long interview with Al Gore and Tipper about the 2000 election and the effect of the media. Tipper Gore tells [author Evgenia] Peretz that following the loss, “we were roadkill … it took a long time to pick ourselves up from what happened.” Tipper also says that Al has made no moves that would suggest a run for the presidency, but adds that if he turned to her one night and said he had to run, she’d get on board, and they’d discuss how to approach it this time around, given what they’ve learned. Update: Gore staffers deny the report. The Telegraph reports that former Gore aides have met in secret and been queried on whether they'd come to work for him if he decided to enter the presidential race. ....aware that he may step into the wide open race for the White House, former strategists are sounding out a shadow team that could run his campaign at short notice. In approaching former campaign staff, including political strategists and communications officials, they are making clear they are not acting on formal instructions from Mr Gore, 59, but have not been asked to stop. One of his former campaign team said: "I was asked whether I would be available towards the end of the year if I am needed. They know he has not ruled out running and if he decides to jump in, he will have to move very fast. "He hasn't asked them to do this, but nor has he told them not to." 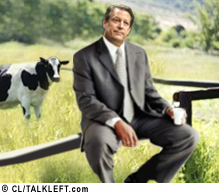 Former President Clinton also suggested on Larry King Live last week that Gore might run. I disagree with those who think the nomination is his for the asking. Plus, I really don't want him to run. I'm happy with the candidates already in the running, particularly Hillary and John Edwards. While campaigning for an Oscar for "An Inconvenient Truth" Al Gore answered presidential aspiration questions on the Today Show this morning. "I am not planning to run for president again," Gore said last week, arguing that his focus is raising public awareness about global warming and its dire effects. Then, he added: "I haven't completely ruled it out." Does he mean it? Is a Gore-Obama ticket in the wings? What would a Gore run mean for Hillary? I continue to believe Obama is going to be a vice-presidential candidate, not the Democrats' nominee for President.